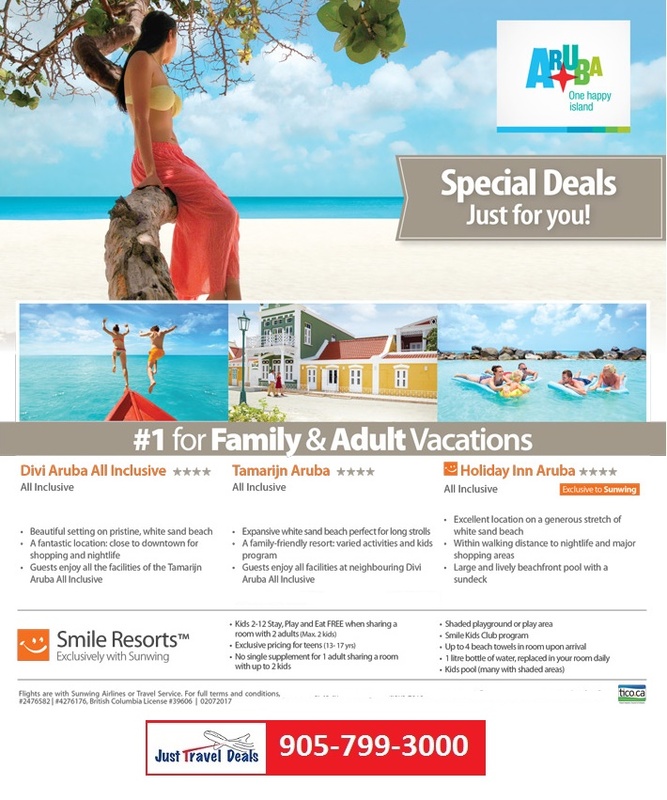 Aruba vacations - Special Deals just for you! This capital city, located in the southwest of the island, is absolutely charming. The Dutch colonial homes in pastel colors give it a real European flair. Walking along the wharf in the morning is a true local experience, you watch the merchants sell their fresh fish and produce right off the boats. You will find here several interesting museums, churches and great shopping opportunities in the duty-free stores. The nearby unusual rock formations, caves and the Arikok National Park are a must for nature lovers. And of course there are the white powder sand beaches. It's double your vacation pleasure at the Divi Aruba. Located on a 1.6km-long stretch of soft white sandy beach, guests can indulge in the facilities and amenities of both the Divi Aruba and the neighboring Tamarijn Aruba. This added feature leaves you with tons of possibilities from sunrise to sunset for relaxation, entertainment and of course dining. At the Divi, days can be spent lazily lounging poolside at one of the three freshwater pools with a refreshing cocktail, or exploring via catamaran, kayak or snorkel. Evenings are lively with themed shows taking place most nights and seven on-site bars for a night-cap: or two. A charming oceanfront resort, Divi Aruba provides vacationers with a laid-back island experience. Imagine waking each morning to the sound of waves gently lapping against the shore, and the smell of a fresh ocean breeze. At the Tamarijn Aruba, each of its guestrooms are oceanfront, so if you love the beach this is the place for you. Set on a 1.6km-long stretch of oh-so-soft white sands, the Tamarijn puts its focus on the sun and sand with an oceanfront rock climbing wall, windsurfing lessons and the Bunker Bar set out over the water. Sweetening the vacation pot a little more, guests of the Tamarijn can take full advantage of the facilities and amenities of the neighboring Divi Aruba All Inclusive Resort. Plus, the nearby Alhambra Casino ensures things really heat up when the sun goes down. Located on Aruba's breathtaking Palm Beach surrounded by white sandy bays, yet only a 10-minute drive from the island capital, Oranjestad, this bustling resort offers the perfect base from which to explore. Featuring spacious rooms with private balconies, air conditioning, mini fridges and LCD TVs - this property is an excellent choice for a relaxing vacation. Other services include a kids club, spa, fitness facilities, a shopping arcade, a zero entry pool with Jacuzzis and casino. Guests can dine at any of the four restaurants on the property, participate in water sports, and relax by the beachside pools. Vibrant nightlife and exciting shopping experiences are nearby, as well as The Butterfly Farm and Philip's Animal Garden.